This delicious and beautiful salad is easy to prepare, and full of phytonutrients and antioxidants. Add some grilled chicken or shrimp and it would make a delicious meal. If you haven’t tried “zoodles” (zucchini noodles), you are missing out! Using a spiralizer or other spiral vegetable slicing tool, use the zucchini to make the zucchini noodles You should have 5 to 6 cups of “zoodles”. Place in a colander set over a bowl and toss with salt. Let the noodles drain a bit of their excess moisture while you prep the other vegetables. 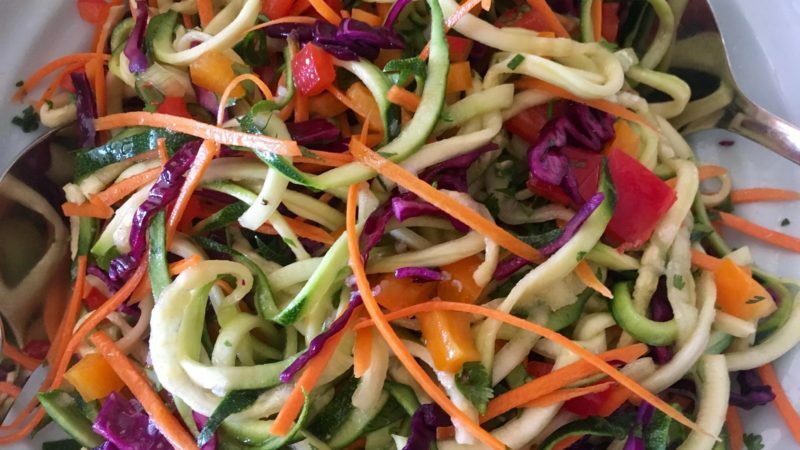 Pour the dressing over the zucchini noodles and vegetables and gently toss to combine.Serve immediately. ← What is Ayurvedic Medicine?